One of the books that absolutely surprised me last year was Cynthia Hand’s Unearthly. I can’t keep stressing it enough, but you know, when a book surprised you, you would have the tendency not to stop talking about it. And this is for a paranormal romance novel friends. That is really something. With that premise in this review, it was obvious that I was one of the squealing readers who well…squealed, when I saw that the next book, Hallowed was available in Netgalley. I was supposed to read it as a reward for finishing NaNoWriMo, but resistance was futile and I ended up reading it even as I was writing. Spoiler warning for Unearthly in the next few paragraphs — stay away if you haven’t read it yet. Hallowed picks up from where Unearthly left off, where Clara was still reeling from the events that happened in the fire and how she messed up her purpose by saving Tucker instead of Christian. There was also that fact that Christian was actually an angel, and how she can’t deny the attraction between them, even if her heart belongs to Tucker. But there are other things that require her more immediate attention, like her angel training with her friend and the fact that the Black Wing could return, and finally, there was her dream. Her dream that tells her that someone important to her is going to die, soon. And there is only so much she can do without falling apart. 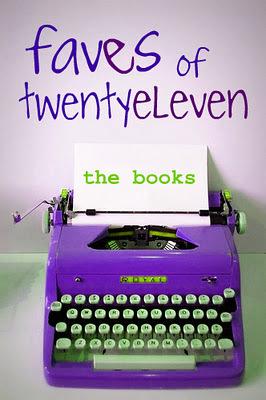 This book was…well, it’s a lot to digest. On one hand, there’s Clara, who’s still a very entertaining character. Her voice still sounds authentic despite the different challenges she had to face, and she never wavered one bit. Her relationship with Tucker was still as sweet as ever, and sometimes I kind of want to stop reading because they got too sweet. :P The great addition in this book, IMHO, was Christian. Love triangles are kind of an old thing in YA, particularly in paranormal romance, but I think the love triangle in Hallowed was exceptionally done. I liked how there was never really a clear answer on who Clara would and should choose, and how the two guys seem to have equal footing in her life. I’m still a huge fan of Tucker, though, but I would like to see how Clara having Christian in her life would play out. I also really loved that there were more revelations to Clara’s angel heritage, and her powers as well. The high points in the book is really with knowing all these things like Clara’s powers and the rest of her family. The revelation is done gradually so we never get too much information, and there were some truly surprising parts. As with Unearthly, I thought the mythology here was also well done, and yet there still seemed to be more that could be revealed in the later books. But you see, Hallowed isn’t really a book that is centered on the romance, or even on Clara’s angel powers. This book is really about family and loved ones and yes, loss. Saying anything more would be spoilery, but it’s probably the thing that could make or break the novel for other people (although I use the term “break” loosely). Hallowed has the capacity to punch you in the gut — hard — and leave you reeling with different emotions. That is what makes this book so different. And good. I can’t remember the last time I willingly read a paranormal romance novel. I really can’t anymore. I am not denying that I used to like the genre, but after finding out that there seemed to be nothing new there, I just wandered off to other genres. 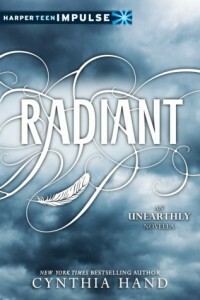 So when rave reviews of Unearthly by Cynthia Hand popped up among book bloggers, I didn’t pay attention. To me, it’s just another angel novel that I will probably wonder why I even bothered after I finish. And then even people who I know don’t really read much paranormal started giving it glowing reviews. This got my attention. I only pay attention to some people when it comes to paranormal romances, so when they give a good review on a book that I normally wouldn’t read and I know they normally wouldn’t read either, I know I’d have to keep an eye on it. 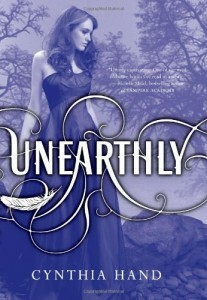 After reading one contemporary novel after the other last month, I gave myself a break from real life stuff and finally picked up Unearthly, wondering if I will like it as much as the others did. Clara Gardner has angel blood — she’s 3/4 human, 1/4 angel, but that 1/4 makes all the difference in her world. She’s different, and she has a purpose in this world. This purpose makes her and her family move to a new town after a series of visions. There she meets Christian Prescott, the boy in her visions that she somehow has to save. Clara and Christian had an instant connection and Clara wonders if it’s not just her angel side that’s attracted. But there’s a catch: Christian has a girlfriend. And there’s another catch: Clara also seems to be attracted to her best friend’s twin, Tucker. Torn between her angel side and her human side, Clara has to make a choice between what she wants and her destiny as an angel. 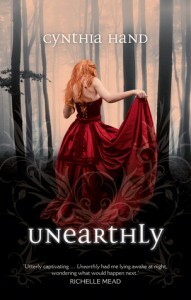 Unearthly AU cover – pretty, right? It sounds like your everyday paranormal romance novel, right? I thought so too. But friends, believe me when I tell you this: it is so much more. I was very surprised with how good Unearthly is. Normally, I hate instant connections, I dislike love triangles, and I don’t like supernatural creatures falling in love with humans, but this one is different. Clara is a believable heroine despite her powers. She’s angel, all right, but even if she’s angelic, she’s also very human (I’m betting she doesn’t need to look for best blackhead remover, though) . I liked that there was a balance between her human and angel side and she’s *gasp! * not a Mary Sue! She’s awkward, she gets shy, she rebels from her mom and even if she’s an angel, she has no idea what to do with her life. She’s a refreshing heroine from all that I can remember of the paranormal romance genre, and I liked it. The boys? Well, there’s really no question who I’m rooting for, right? :) I found Christian a little too perfect, but it was actually in all good reason once you get to the end. Tucker, oh Tucker. I loved him. :) I loved how his character developed, I loved how he got into Clara’s life. I liked that he wasn’t perfect, and I liked that he’s just…well, human. The description in the blurb says he appeals to Clara’s non-angelic side, and it’s easy to think that he’s, well, evil, but he’s not. The more accurate description should be, he appeals to Clara’s human side, and that made him very adorable for me. 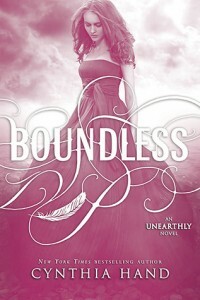 The romance in Unearthly is *another gasp! * quite healthy, too. Lots of banter, conversations and time spent together — none of those “I saw him and fell in love” thing. Yes, even the instant connection with Christian was toned down with conversations and whatnot. And it was definitely refreshing.